This is one of those issues that should be huge and should receive coverage for years as an example of the worst kind of Congressional corruption. 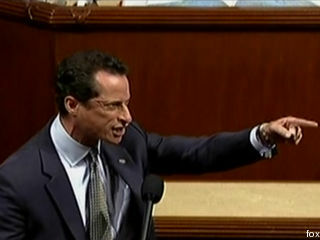 By now you might have seen Rep. Anthony Weiner’s (D, NY) outburst on the floor of the House July 29, 2010. It was an impassioned response immediately after Rep. Peter King’s (R, NY) own relatively passionate speech. You can view both here. The Daily News lays out the specifics: “The bill would spend $3.2 billion on health care over the next 10 years for people sickened from their exposure to the toxic smoke and debris of the shattered World Trade Center. It would spend another $4.2 billion to compensate victims over that span, and make another $4.2 billion in compensation available for the next 11 years.” This amounts to $11.6 billion for 21 years in total. Given the tragic nature of any hero suffering for selflessness in the downtown chaos of 9/11, such a well-meaning bill should face absolutely no opposition from anyone with a conscience. Additionally, this bill is a long time coming, given that it is 9 years in the making. Official Jargon Warning!! The vote on Thursday was “On Motion to Suspend the Rules and Pass” the bill. To the chagrin of CNN’s Ali Velshi (see below), I am going to discuss the specifics of the procedure, for it effectively prevents the very heart of Republicans’ concerns from being debated. In other words, the Democrats in the House limited (and thus expedited) debate on this matter, with the caveat that they would need 16% more votes than they would normally need if rules were not suspended. Of course, it turned out that this bill was controversial. Instead of getting the requisite 66% of votes, the bill only garnered 59%, with votes largely along party lines. Weiner vented because he did not see the bill as controversial. There are a few amendments to the bill that the Republicans believed were essential. These amendments, of course, were suspended under the procedural maneuver. In the end, this particular Republican concern centered on the economic and employment effects of the bill’s tax. 3. This is tied to the larger issue of preventing the scamming of money from this bill. Rep. Lamar Smith (R, TX) worried that the bill “does not contain the necessary protections to safeguard taxpayer dollars from abuse, waste and fraud.” Republicans objected that the compensation created a “slush fund” under current provisions. It is important to understand that scamming this fund and allowing its money to go to illegal immigrants does not just reward the undeserving, but specifically punishes the suffering 9/11 heroes. I have yet to hear this point being made clearly, but it would be the single worst consequence of passing the bill as is, if Republican concerns about oversight are truly well-founded. Of course, debate has been stifled on the House floor, so we do not know just yet. Regular rules call for what is known as a simple majority vote, which means that if more than half of the Congressmen vote “aye,” the bill is passed. 59% voted “aye” this time around and the Democrats control the House. As they have done plenty of times since January 2009, they could have voted to keep every single provision in the bill as is. On this basis alone, it would seem that Weiner has no one to yell at except for those who motioned to suspend the rules (the Democrats). Instead, Weiner rants that the Republicans defeated the bill. If you look at this without a grain of nuance, you might be tempted to agree. Unfortunately for the truth, Rep. King is not the greatest spokesman, so he was not able to make his case as well as Weiner did on the House floor and in interviews thereafter. Given the situation as it appears today, almost everything Weiner says on this issue is a misconstruction of the facts and/or is hypocritical. He blames Republicans for (a) politicizing the bill, (b) finger-pointing, and (c) stalling, while (a) he is the one making a spectacle, despite the fact that bills are often voted down on procedural grounds and despite the fact that the bill is now scheduled for further debate after recess, (b) he is constantly citing how many Republicans voted for the bill and how few Republicans were needed to pass the bill, and (c) he belongs to the party that has held power in Congress since 2007 and only now decided to bring the bill up for a vote in a pre-recess rush (again, Democrats can vote the bill through the House without a single Republican supporter). Anthony Weiner had the opportunity to explain himself in an interview with a fawning Ali Velshi at CNN. A few points here reveal so much about his character in this narrative. The fact that the excuses that were being made… “Well we don’t like this being done so quickly”; “we don’t like it being made on this calendar”; “we don’t like it on this day.” At the end of the day, I think the American people want us to stand up and vote for what we think is right, and that’s what got my goat last night. The opposition is portrayed as a mass of powerful misanthropes in black cloaks pointing out minutia to prevent any semblance of positive progress. Vintage propaganda. His answer to why the procedure did not work started by explaining the purpose of the procedure. How perfectly irrelevant. But Ali Velshi did not want to go into House rules, so he was probably satisfied with the answer, and did not think to pursue the subject further. Weiner then spends most of his answer pointing a finger at Republicans while complaining about Republicans, “calling names of Democrats.” He chides them for politicizing the matter, as though he was not guilty of the very thing at the moment, and complains that Republicans were stalling, when it is true that, again, the Democrats can pass the bill whenever they want because they have enough votes for a simple majority. Is the idea of representing the wishes of a constituency so foreign to Rep. Weiner? I think it’s time for me to move from his district. Anyway, it’s good to know that Weiner believes that the time to complain about procedure is after the vote has already taken place. It’s good to be aware that he knows exactly what he’s talking about. On its face, this episode centers around a bill with a very humane idea and the King-Weiner exchange makes the Democrats look great and the Republicans look awful. But the Democrats could pass the bill whenever they like. Instead, they used an “arcane,” yet apparently standard, procedure that prevents debate. Republicans had serious issues with several of the provisions and oversights of the bill and debate will take place later. Did the Democrats know Republicans would vote this down? Were they trying to score political points? If they were, then kudos to them. Did the Democrats merely want to stifle debate because they did not want to go on record supporting illegal aliens benefiting from this bill or vice versa? Did the Democrats not want to go on record supporting what might be viewed as a tax increase and unemployment booster? Did the Democrats not want to fight the certain “abuse, waste and fraud” of a 9/11 health slush fund? This is upsetting to me as a New Yorker and as a human being in general. The only people who lose out are those brave and unfortunate men and women that abandoned their personal duties and helped the country on September 11th. It is time the country repaid them, and any sort of politicization of this is simply unacceptable.